Small body 00-size 12-string in spruce/birch with under-saddle pickup, 2” nut, 2 5/6” string spacing, fun to play acoustic or plugged in! 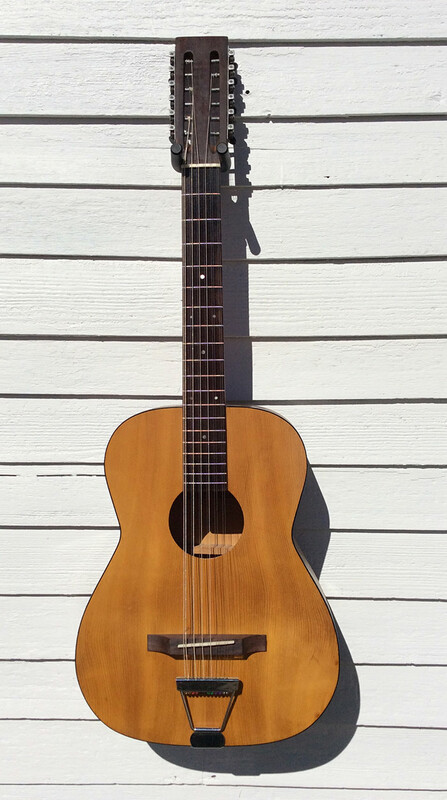 This little 12-string is a marriage between a mid-century 00-size Kay body and a custom 12-string neck. The smaller size and configuration is loosely based on the Gibson B25 12-string. It sits easy in the lap and can be played plugged in or acoustically with bare fingers or flatpack. SPECS: 00-size body, 12-fret mahogany neck with slotted headstock, double “T” bar neck reinforcement, ladder-braced solid Spruce top in natural finish, birch sides and back in original stained tiger stripe finish, neck in natural finish, new StewMac tuning machines, neck with nice “C” profile, rosewood fretboard with new frets, MOP markers, rosewood bridge, bone nut and saddle. Nut width: 2”, String Spacing: 2 5/16“, Scale length: 25”, Upper bout: 11“, Lower Bout: 14 1/4”, Body length: 18”, Widest body depth: 3 7/8”, Overall length: 39”, Neck thickness at 1st fret: 15/16”, Neck thickness at 5th fret: 15/16”, Action: 1/8”, string gauge setup: D’addario EJ35 gauge in standard tuning. CONDITION: Solid rebuilt condition. Bracing was updated to accommodate modern string tension. 3 top hairlines repaired, neck shoulder scratch, average top deflection. Finish has scuffs, crazing, squiggles, edge wear, with some gouge and seam shrinkage. Other work included neckset, new fretboard/frets, bridge and setup. SOUND: This guitar is not big and boomy like the huge 12-string jumbo bodies out there but it’s not intended to be. The tone is clear and crisp with above average resonance with a flatpack or offerings a more intimate sound played bare fingers. I can setup the guitar to suit your playing style, light or heavy-handed before shipping.